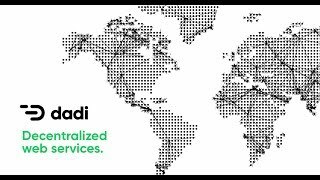 DADI is a global, decentralized cloud services platform, offering compute power, database storage, content delivery and other functionality to help businesses scale and grow. With DADI there is no single authority that regulates computing resource distribution. The platform uses cost-efficient fog computing organized by a Decentralized Autonomous Organization (DAO) rather than a centralized cloud structure, removing the need to pay in advance for private and monopolized cloud computing platforms such as Amazon Web Services (AWS), Microsoft Azureand Google Cloud. DADIâs web services are organized around a microservices architecture that provides a series of intelligent apps for building digital products. Every digital product is powered by web services. And every business using the web will have the option to build on DADIâs platform at a price point unimaginable today. Moreover, all Internet users will be able to use DADI to generate passive income by providing their computational resources for rent. DADI represents a radical overhaul of the cloud computing sector. Its mission is to uphold the founding principles of the Web by democratizing computational power.